If there’s one trend we can’t get enough of this season, it’s rose gold. The trend for this delicate, subtle metallic started in the fall and showed no sign of letting up yet. It is quite literally everywhere – from the homeware departments of major stores to catwalks all over the world. Been wondering how to incorporate it into your personal style? This guide will tell you how you can do so. If you are going to embrace this trend, there’s no better way to do it than taking the plunge with rose gold hair. This has been a huge sensation on social media – just search the hashtag ‘#rosegoldhair’ on Instagram, and you will be immediately greeted with millions of results from all over the world. However, taking this shade from the color swatch and onto your head isn’t the simplest of tasks. If your hair is naturally very dark, you may want to abandon this idea altogether, as this look will require a lot of bleaching and therefore a lot of damage could be caused to your hair. The typical way to achieve rose gold hair at home is by dyeing it to at least a golden blonde and then adding a touch of pink to bring out the rosy tint. Be warned: it requires a LOT of maintenance. But if you are willing to stay on top of the upkeep, you will find that it’s a unique, stunning color to have. Even if you’re not a natural makeup aficionado, don’t fear. Rose gold is a relatively easy makeup trend to master, partially because it is subtle yet classy at the same time. Invest in an eyeshadow palette that gives you various shades along the pink and gold spectrum – the more glittery, the better! You can even use varying shades of rose gold and pink to create a more subtle version of the classic smokey eye. Plus, this shade compliments nearly every eye color going, so you can be sure that your eyes will steal the show. Rose gold is also a great color for lips and nails, and many great makeup brands have branched out into these products recently. If you’re going to embrace the rose gold trend, you had better start where it all began: with jewellery. Rose gold is a hybrid metal, made from a combination of classic gold mixed with copper. It has dipped in and out of the fashion spectrum, being very popular in Russia in the 1800s, then seeing a resurgence in 1920s America. 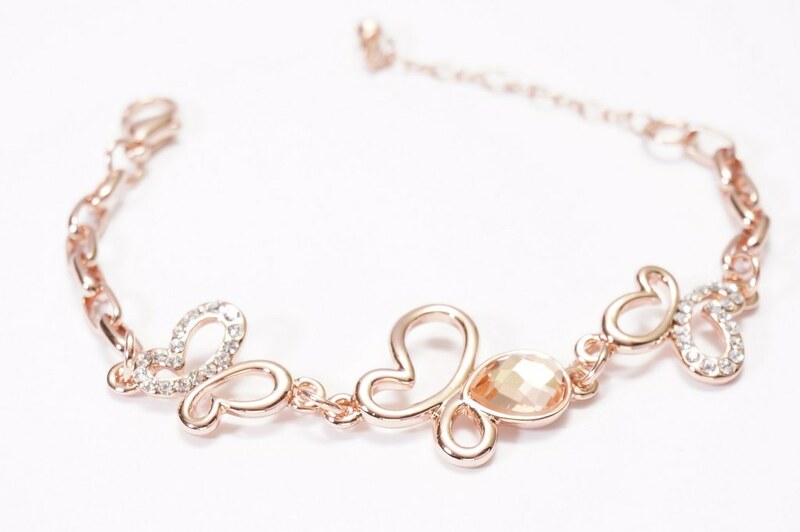 You will be able to find lots of womens jewellery that embraces the rose gold trend, and it can be the perfect balance between that subtle shine and full-blown bling. Getting that rose gold vibe into your closet can prove a bit of a challenge – as, after all, the whole point of rose gold is that it is metallic. Be mindful of going overboard wearing all metallic as this can sometimes look a bit too intense. Instead, opt for a top or a dress with a metallic rose gold sheen, and then use muted pinks or beige hues in the rest of your outfit to compliment the look.